Sun-kissed beaches. Turquoise waters. Swaying palms. The 32 islands of Saint Vincent and The Grenadines offer all the hallmarks of a tropical Caribbean paradise, while remaining free of the tourist crowds of better-known islands. This is the authentic Caribbean, virtually untouched by time. Among the islands is Palm Island, our very own private island resort. 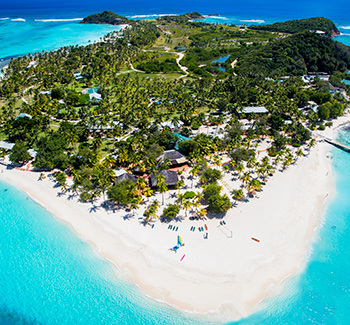 The Grenadines are popular with celebrities and royalty seeking a secluded hideaway. Britain's Princess Margaret owned a villa on Mustique, an island now synonymous with the jet-set world. Overall the islands offer a diversity of lifestyles from yachts and trendy boutiques to ramshackle rum shops and century-old cafés. A lush rainforest, volcano, waterfalls, coral reefs and lagoons offer a wealth of activities from hiking, swimming and sailing to snorkeling, diving and turtle watching.